In 2012, a major re-design of the site – along with a name/URL change to its current form (CPhMag.com) – had me ditch the various components that by then had become common in other forms. For example, links can now be accessed through my Twitter feed (@jmcolberg). At the same time, I started focussing exclusively on long-form content, because that’s where my heart is. I like writing about photography. I believe there is a need for it. Photography has become possibly the most relevant means of communication, especially online. For the sake of not just the photography community but our societies at large we need to understand what this medium does and how it does that. I also believe that it is possible to talk about contemporary photography in a way that is widely accessible (free of jargon or art speak), truly critical, and enjoyable at the same time. This site does not have any advertizing, because there is too much of that online already. There are no pop-ups pestering you to sign up for a mailing list. Lastly, I also do not accept corporate sponsorship, because I strive to maintain full editorial independence. It is for this particular reason that I decided to have a fundraiser in the form of a GoFundMe page. Your contribution will help me continue what I’m doing here. At the same time, I also want to start a new venture, which I have been thinking about for a while. Beyond supporting a website, there ought to be an added reward. So starting some time in mid-October 2017 and initially roughly every two weeks, anyone contributing $10 or more will receive emails with additional content. That content will not appear on the site, and it will also differ from my regular programming. To begin with, I will focus on a series of writing about found photographs. But there might be more – much like the site itself, I am excited about the challenge of exploring this different form. Thank you for your support! It means the world to me! For a while now, I have been trying to wrap my head around the idea of transgression in photography. How do I feel about it? I don’t know. There’s no clear answer. Just to make this clear, when I use the word transgression I mean it in a fully ethical sense. Some practitioners might consider the use of, for example, out-of-focus photographs transgressive. But that’s not what I’m interested in here. I’m interested in photographers stretching ethical boundaries or leaping beyond outright. You would imagine that it would be simple to come to a conclusion concerning ethics violations. If you spend any amount of time on social media, there is no shortage of outrage and conclusions. I don’t mean to say that the outrage and conclusions aren’t valid per se. The rate at which they are being produced, the fact that vast parts of the internet have become an outrage machine, where someone is always offended by something and has to vent about it — I’ll admit I find that more than a bit tedious. But when something is ethically wrong in photography, we need to talk about it. Before I go on, I should probably make it clear that I’m not generally in favour of ethics violations. There are already so many in this world that adding more seems outright obscene. However, desperate times might ask for desperate measures, or maybe for measures that not just aim at making us outraged about other people’s problems, but that also make us uncomfortable. It might be good to talk about something specific. There are plenty of topics that center on ethics violations. For example, a few years ago, I wrote about street photography and about the simple fact that these days, most people want to have a say in whether or not their picture can be taken, regardless of what a bunch of photo geeks familiar with their medium’s history think. In a sense, that was relatively easy for me to write because I couldn’t care less about street photography. I know where that type of photography was coming from, and for a while, it indeed was interesting. But it stopped being interesting something like thirty years ago. I’m much more interested in portraiture. Portraiture is interesting for me, because I love looking at people’s faces (in principle anyway). Taking a portrait is really easy: all you have to do is to point your camera at someone’s face, and then you got a portrait. In all likelihood, unless you’re really talented and experienced, it’s going to be a lousy portrait. I’m writing this as someone who has taken a lot of lousy portraits, as someone who has looked at a lot of lousy portraits. It’s difficult to describe what it exactly is that makes a great portrait, but we usually know one when we see one (way before the street-ethics piece, I produced two articles about this very topic, asking a large number of people what made a great portrait. You can find the pieces here and here). You probably want to ask your subject for permission if you want to take their portrait. But of course, you don’t have to. You could just photograph them, having a lot of what I wrote in my street-ethics article apply. You would then be in Philip-Lorca diCorcia territory: Heads. I think diCorcia’s photographs are fantastic. At the same time, I’m troubled by the ethics violation involved in their making. Coming back to where I started from, Heads is a very good body of work that I would describe as transgressive. Even though I could see how someone might reject the work purely based on ethical considerations, I could never even remotely go there. I can live with the transgression, which, of course, is easy for me to do, given my rights weren’t violated. But I’m aware of that, and it bothers me: I don’t like the idea of dispensing with other people’s rights when mine aren’t at stake. This is where and why the idea of transgression has me interested, because it doesn’t allow me to come to easy conclusions. In cases that deal with ethics, I usually apply the “how would I feel about this” test. How would I feel about seeing myself as one of those Heads? That’s a purely theoretical question, of course. But I’m certain that I would be flattered. The one thing that would certainly bother me, though, is fact that I would be unable to buy one of those pictures, because they’re so expensive. The “how would I feel about this” test is good, but it has its shortcomings: if you place yourself into another person’s position, and you wouldn’t be too distressed about some transgression, you still want to remember that the other person might feel very differently. At the very least, though, the test provides a good starting point. Let’s look at more examples. In this particular context, it’s very interesting to compare Martin Schoeller‘s Close Up portraits with Bruce Gilden‘s Faces. In more ways than one, it’s basically the same project, except that Schoeller photographed in a studio, to a large extent using assorted celebrities, while Gilden worked outside, basically relying on people whom you’d be very unlikely to find in Schoeller’s studio. I think Schoeller’s Close Up portraits are unbelievably bland. They’re very competent pictures, but they’re basically magazine cover pictures (even the ones that never made it on any cover). As a viewer, you just know that those portrayed will feel not only very good, they’ll feel flattered. In contrast, while Schoeller’s pictures are incredibly flattering, Gilden’s are the complete opposite. On days when I wake up in a grumpy mood, I consider them cruel, done for an effect that those portrayed might not even be able to grasp (and the latter really is the ethics violation that gets me). I really don’t like either project, and Gilden’s just ruffles my feathers a bit more because of its ethical defects. If I had to choose one to look at (let’s say, someone forced me to) I’d pick Gilden’s. I wouldn’t have to think long about that. Again, Gilden’s Faces are transgressive (while Schoeller’s are anything but), and it’s exactly that fact that somehow draws me to them. It makes me uncomfortable to look at them, for a large variety of reasons. In discussions with students, the idea of collaboration in portraiture comes up a lot. I don’t subscribe to that idea. It might work for a variety of contexts. But if you want to make portraits for an art context, there can be no collaboration when the portrait is made (that’s already a bit transgressive, but not much). Another idea that often gets mentioned is that the photographer ought to make a respectful portrait or something to that effect. I don’t believe in that, either. If you want a respectful portrait, go to a Sears portrait studio. Why should a portrait be respectful? Art photography shouldn’t be merely a feel-good exercise. OK, I get the idea why a portrait should be respectful, because of course you want to respect the person in front of you (to the extent that that’s possible: some people simply make it very hard to have any respect for them, let’s say when there’s a very racist, sexist person who holds a high office). But there is a difference between looking at a person in real life and in a photograph. A photograph is not real life any longer, even though it is taken from real life. A photograph is just a picture. Even though we are so wedded to the idea that a photograph ought to truthfully reflect a person (whatever that might actually mean), in reality that idea is really boring. It makes for boring pictures, and it doesn’t do anything that good art can do to us, namely to shake us up, in whatever way, or to move us. Consequently, the making of a good portrait involves some aspect of transgression, of pushing beyond at least some boundaries, to get to a point where something interesting happens. The transgression is not done for its own sake — that can’t be (if it is, you’re just a jerk with a camera). It’s done to arrive at a higher truth. But the transgression also comes at a cost, a cost that can be quite steep, a cost that the viewer should feel. I’ll be honest and admit that I have no idea of how to deal with the costs of photographic transgressions. I do think they’re necessary, lest we live in a very bland world that pretends everything is in order while every possible actual problem is simply being denied. At the same time, I have a very strong sense of justice, of believing in an ethical society. I feel incredibly guilty every time I take a picture of a stranger without asking, but I do it anyway (not all that often actually, usually my guilt wins over). I’m lucky enough that these pictures are all lousy enough that I never feel they should be seen. But I also feel that in this day and age of constant social-media outrage, much of it performed for very valid reasons, things too often get too easy, too simple. In photography, there aren’t always simple solutions. Many of the best photographs we have seen have some form of transgression attached to them (not to mention the “all photography is exploitation” discussion). These transgressions weren’t done for the sake of it, and we don’t even necessarily have to sanction them. Still, to dismiss the photographs simply based on whether a transgression exists runs the risk of denying ourselves being exposed to some higher (or at least different) truth, a truth that might help us see more of not just the world but also of ourselves. Lots of photographers don’t trust their pictures. They don’t think or feel that what in the broadest sense is contained in their pictures will communicate itself to their viewers. Even worse, there could be something communicated that s/he either didn’t think of or, even worse, something that s/he does not want to be communicated. For a large variety of contexts, these are valid concerns. For example, if you photograph a car for use in advertizing that car better look fantastic and not like the jalopy it might actually be. In the context of art, however, such concerns become hugely problematic , because art doesn’t operate along such lines of thinking. Art lives from the fact that while it communicates something potentially very powerful, one might be hard pressed to describe with a few simple words what that “something” is. As a consequence of these concerns a lot of photography that purports to be art ends up being not quite that. Instead, it ends up as the the kind of art where you look, and the first (and only) thing that comes to mind is “Oh, I get it.” There’s nothing particularly wrong with this type of art – it has its uses. But it’s not very good art. At worst, it becomes agitprop. Without giving examples I do believe that quite a bit of particularly topic-based art these days is little more than that, tedious agitprop. As a brief aside, it’s difficult to talk or write about this problem simply because as a culture we are increasingly moving into a corner where dissent is seen as an admission that the dissenter is outing her or himself as being on the wrong side of history. Let’s say there’s a piece of art about a topic we all care so much about. We then all also have to praise it in the ways we have started to deem appropriate. To do otherwise would not mean that we would talk about art, no, we would out ourselves as actually not agreeing with the topic itself. To be perfectly honest, especially in the United States the way art is discussed has started to remind me of how discussions were had in Stalinist countries, where you either toed the party line, or your not toeing the party line meant that you were part of the problem, that you were to be shunned. This development worries me deeply. Needless to say, the problem with didactic art isn’t necessarily that it supports neo-Stalinist tendencies – even though in a situation like the one we’re finding ourselves in it can become problematic. The problem with didactic art first and foremost is that it’s bad art. At the very core of art lies an ability to reach people in somewhat specific, but also very vague ways, ways that might be hard to put into words. By construction, photography struggles with being art the most. I believe this is because of two reasons. 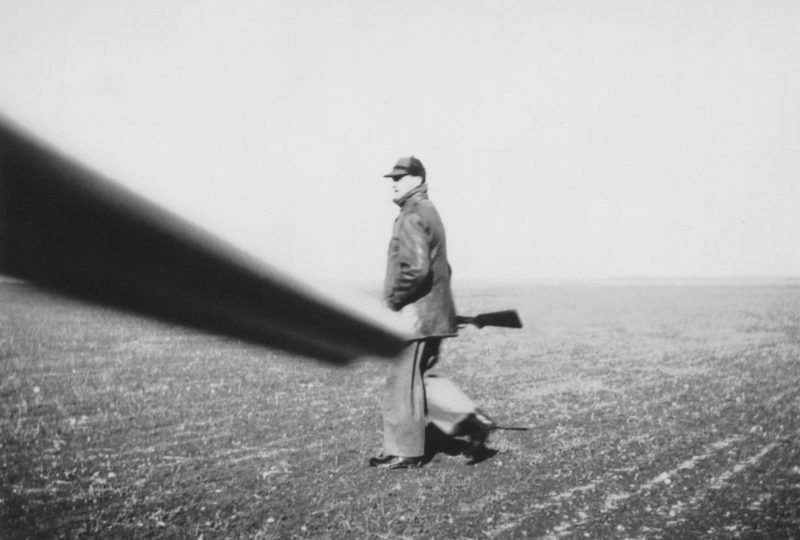 First, photography’s artifice is apparent only to insiders. You don’t have to be a painter to be able to see what an artist did in a painting, even though of course you might not understand technical details. But when you are confronted with a photograph, that’s a lot harder to do that. The second reason is that it’s so tempting to think that what a photograph is about is exactly what is being depicted. Obviously, that doesn’t necessarily have to be the case. But my use of that word “obviously” gives away what I am, a photography insider. It’s really not that obvious for others (and even for many photographers themselves). This second reason is where photography can easily become didactic. Didactic photography starts out with insisting that what is inside the frame is it, is everything there needs to be considered, that, in other words, anything outside of the frame is to be discarded. This isn’t necessarily a problem if you want your photography to be didactic. For example, Bernd and Hilla Becher‘s entire oevre is essentially didactic. What makes their work so great, though, is that insistence on didacticism, offering a topic that will never, ever offer you the “Oh, I get it” result: most people would not stop in front of anonymous industrial sculptures and marvel at their shapes. In fact, you would have never even considered any of the constructions photographed by the Bechers as anonymous sculptures had they not done exactly that to show you. So didactic art isn’t bad per se, but it still has to somehow subvert the viewer’s expectations. It has to move her or him in unexpected ways. Most didactic photography does not do that, which is why I find it so unbelievably tedious. Oh, I get it. Next! 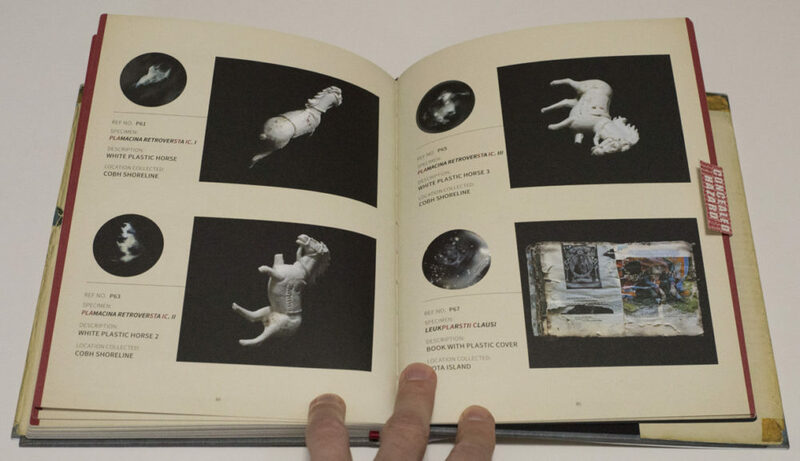 On a surface level, Mandy Barker‘s Beyond Drifting is didactic, at least in its book form. After all, the book is made to look like a late 19th Century science book. In fact, the attention to detail employed for production is impressive. Take off the dust jacket, and the book’s hard case really looks and feels like an old book. There is a fake library note added to the end papers, and it comes dog eared. The pages’ corners are rounded etc. The production plays a necessary role of the overall illusion. As it will turn out, while the book pretends to be didactic in a specific way, it actually is not. The illusion is that you, the viewer, are faced with a late 19th Century book showing an assortment of microscopic sea organisms. These organisms are presented in round photographs, for the most part lacking the kind of technical details one would expect to see in 21st Century photographs. The images also reference what one might be familiar with from science programs, where a view through a microscope might offer a round image with blackness around it. 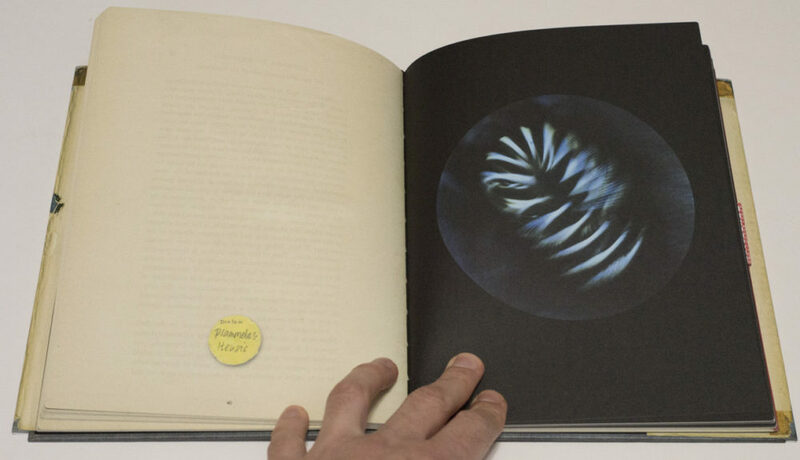 If that were indeed the idea behind Beyond Drifting, to show microscopic sea organisms in an old-timey way, it would be the kind of didactic book that would hardly warrant a second look. But it’s not. There is a smaller section in the back, entitled “Plates,” with a red sticker covering it (with the “concealed hazard” warning printed on top, the sticker somewhat breaks the illusions before the viewer has a chance to see). In that section, Barker reveals what the images really are, namely pictures of mostly plastic trash picked up on a beach. As it turns out, with a little photo trickery, you can make plastic trash look like plankton. So the book’s reveal is the kicker, and quite a kicker it is. Barker is hardly the first artist to have focused on the insane amount of plastic trash polluting the oceans. Almost all of those other examples I can think of employed exactly the kind of pointing didacticism that ultimately makes the work so toothless: “Here, isn’t this bad?” We can all nod solemnly and go on consuming plastic, producing more trash (if the plastic-trash problem has not got you worried, how about this very recent article: Tests show billions of people globally are drinking water contaminated by plastic particles). But because Beyond Drifting manages to get the viewer so interested in the beauty of marine creatures, only to then unmask those beautiful creatures as ugly trash, it won’t get the viewer nodding: s/he has become too invested in what s/he was looking at. And that’s really one of the problems of didactic photography: it’s hard to get your viewer invested, whether it’s to engage with the work in the first place or whether it’s to create the kind of emotional hook that all good art requires. Without an emotional hook, photographs will ultimately fall into oblivion, regardless of how many times they were shared on social media at some point in time. The next viral sensation is always just around the corner. Let’s face it, almost everything is interesting in some ways. What’s more, there is a huge number of pressing problems we all know we should deal with. Didacticism is the worst possible way to get people interested beyond the surface level of “Oh, isn’t this terrible?” To get deeper, you need to get people hooked. Beyond Drifting can serve as a excellent example for how this can be done. Now that another summer has become part of the most recent past, it’s time for regular programming to resume on this site. These past few weeks, I have been very busy with my own photography, which has both allowed and forced me to apply the lessons that most of the time I merely teach others. If there’s one aspect that has made the various (so far quite minor) struggles a bit easier it’s the realization that at the end of the day, it’s just pictures. Yes, it’s really just pictures — you can take them out of an edit (or add them back in), but it’s just pictures. Photographers often discuss and treat their pictures as if they were these grandiose entities, which very rarely they can indeed be, albeit for very short periods of time. But they’re just pictures, and I wish we could all realize that: it might help us break through the often very orthodox and narrow-minded conservatism that pervades such large parts of photoland. But onto other people’s pictures and what they have made with them in the form of books. Whatever you can or want to say about Nobuyoshi Araki (and there is a lot I could easily think of), his Sentimental Journey is sui generis. The work ought to be the starting point for any serious engagement with the artist. For those who are not overly familiar with Sentimental Journey, things can be a bit confusing because there is the original book (recently reissued), and there are various add-ons or follow-ups. Thankfully, there now exists Sentimental Journey 1971 – 2017 – (yes, that is the title with that added “-” at the end), which chronicles the full time span of the photographer’s relationship with his wife Yoko, far beyond her death in 1990. It is in this work that Araki has allowed himself to be at his most vulnerable, a vulnerability that to some extent blunted many of his impulses, which especially after 1990 have taken his work to often rather unseemly extremes. 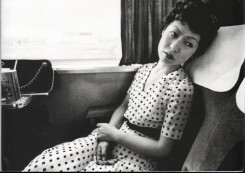 As Michiko Kasahara, chief curator of the Tokyo Photographic Art Museum, notes in an essay at the end of the book “when it comes to Araki’s depiction of ‘women,’ he clearly displays a clearly sexual discriminative, misogynistic, viewpoint that is typical of Japanese men of over [sic] a certain age. […] For better or worse, we are able to glimpse the Showa-period male’s concept of women and view on life and death running throughout Araki’s body of work.” (We might note that outside of Japan, the situation is hardly any different, and it’s not even necessarily tied to age.) In general, the essays in the book are a welcome addition, for the most part helping the viewer to understand the man and his work better. Apart from two curators, there also are various photographers reflecting on a single picture from the series that they picked. The depiction of a photographer’s partner forms a well established part of photography’s history. To be honest, in most cases I couldn’t care less about the work. It’s true, every practitioner managed to produce maybe one or two, occasionally maybe even a handful of good pictures. But all too often, I’m left with the feeling that the partner stood (or stands in) more for that convenient photography object (yes, I’m using this word on purpose) than for an actual, real partner. What makes Sentimental Journey interesting for me is that this is true for Araki as well, but somehow what I am made to feel is a lot more poignant than when I look at, say, … Oh, just add any of your usual (male) suspects here. In particular the section in the book covering Yoko’s death is profoundly heart breaking. It’s true, they’re just pictures. But for me, as the viewer, they speak of something that for the maker, Araki, they cannot possibly have expressed enough. Now that really is photography. More than any other Western nation, the United States sustains itself through a series of myths that are sharply at odds with its actual, lived reality. The Trump presidency, which openly advocates and rests on white supremacy, has thrown some of these myths into sharp relief. Needless to say, many myths are fairly benign and don’t necessarily carry explosive potential of any kind. A good example is provided by Walden Pond and its environs, made famous by Henry David Thoreau’s text. In actuality, we’re talking about two places here. There’s the geographical one, near Concord (Massachusetts), just outside of Boston, and there’s the mental one, the one described and conveyed through Thoreau’s writing and through everything that with time has been layered upon it. In a most obvious sense, if you were to drive to Walden Pond, you would be very unlikely to encounter the latter, in part because it has become more a myth than a useful guide for how to approach the actual location. Photographers tend to struggle with ideas of place, because often, they cannot separate physical from mental spaces. In particular, mental spaces tend not to show up once physical spaces are photographed. If they did show up, photography would be an awfully boring and tedious medium: It’s in the gap between what one wants to see and what one is able to photographically describe that art is being made (to be clear, photographers’ struggle typically centers on accepting this basic fact). S.B. 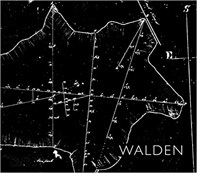 Walker‘s Walden presents photographs taken around, well, the actual location. I can’t help but think that in the end, these fine pictures will get weighed down by expectations they cannot possibly fulfill. To begin with, though, I will have to acknowledge my being an outsider, given I didn’t grow up in the US. Walden is just another one of those somewhat strange myths that I have come to learn about. So for me, these pictures really are just that, pictures. And I’m thinking that maybe it’s because I don’t have this cultural baggage that I can enjoy them in a way that might be inaccessible to people who grew up with the myth. Mixing landscapes with portraits, Walden describes what looks like a quintessentially New England environment. The landscape photographs for the most part are good, even though I feel they were made to express something they can’t (see the above). They feel a little strained; I can sense the maker’s desire for them to be poignant in them. I’m a lot more interested in the portraits. To be more precise there are photographs of people that were taken with a very resolved and clear interaction between the subjects and the photographer. And there are pictures of people that look like the photographer stumbled on some scene. I originally was going to prefer the former over the latter, but I realize that doesn’t work, because there are very good pictures in each set. In these portraits, I feel I am brought to encounter another person, or maybe a group of them, going about whatever business they’re going about, but clearly being present at this particular location for a particular reason (which thankfully might or might not have anything to do with Thoreau). You could say that for portraits taken at any location, of course, but something is happening here, in these pictures, that has me interested in these people, at least some of them. Here, I feel the photographer’s opinion. Here, the photographer manages to bring the place and its myth closest together. If Walden is mostly quiet and cerebral, Nemini Parco by Jesús Monterde is anything but. It’s deeply visceral, at times violent. It is, in effect, a book about the sheer brutishness of life, and of life’s inevitable conclusion, death. While I don’t necessarily enjoy seeing the few images of slaughtered animals, the book is something that I realized I was craving. These days, contemporary photography all too often is so polite, so cerebral, so toothless, so, let’s face it, just goddamn boring with its safe “explorations” or “investigations” of topics we all agree on anyway. What excites me about Nemini Parco is not just that it clearly breaks out of photoland’s beloved safe havens, it also does it so effortlessly, while, at the same time, avoiding mere shock (or presumed shock) value (think Bruce Gilden or Antoine D’Agata). While everything is described in pretty much the same manner — narrow crops filled in with harsh flash, this description still allows the photographer to cover a range of emotional qualities, including even moments of tenderness that are then ripped apart by horror (or the other way around). So the book might be visceral, but it allows the viewer to explore more than s/he might imagine at first. Life and death are big themes, and some of its aspects might be fairly grim and shocking to witness. At the same time, there is beauty to be found in the most unlikely places, and it’s the book’s insistence on that beauty that ultimately makes it such a gratifying piece of art. Clearly one of the best books I’ve seen in quite some time.